One of the world's poorest countries, the Indian Ocean island nation of the Comoros has endured years of political turmoil including a spate of coups. Here is some background on the country, where gunfire erupted near a military barracks in the capital Moroni on Thursday after the arrest of a defeated presidential candidate. Incumbent President Azali Assoumani was delcared the winner of Sunday's poll but the opposition says the results were rigged. Made up of the islands of Anjouan, Grande-Comore and Moheli, the small country has a population of nearly 814,000 on a land surface of 1,870 square kilometres (772 square miles). It is densely populated, with about 400 inhabitants per square kilometre (1,150 inhabitants per square mile), according to World Bank data. The Comoros, which means "Islands of the Moon" in Arabic, are situated between Madagascar and Mozambique, and next to the French-administered island of Mayotte. It embraced Islam in the 12th century and 99 percent of its people are Muslim, mostly Sunnis. Just over half are aged under 20 years. The Comoros became independent from France in 1975, breaking away in a referendum in which nearby Mayotte opted to remain with the colonial-era power. The Comoros continues to lay claim to Mayotte and is backed by several UN resolutions. Mayotte is relatively well-off compared to the impoverished and unstable Comoros, and grapples with an influx of illegal migrants -- many of whom make the 70-kilometre (40-mile) crossing in makeshift boats. Since independence, the Comoros has endured more than 20 attempted coups, four of which were successful. The first president, Ahmed Abdallah, was ousted a month after independence with the help of renowned French mercenary Bob Denard. In 1978 Denard organised a coup to reinstate Abdallah and became army chief. Abdallah was assassinated in 1989 in as yet unexplained circumstances. Denard, then head of the presidential guard, tried to take control but fled as France intervened militarily. 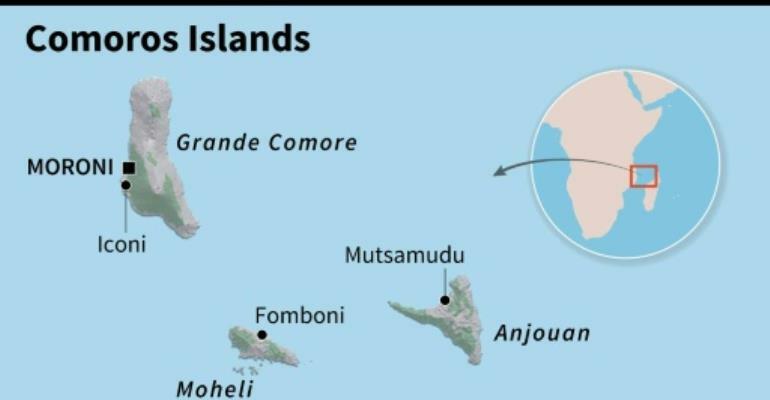 The island of Anjouan seceded in 1997 and only rejoined the others in 2001 after a new constitution created the Union of the Comoros that allowed more autonomy, including rotating the presidency between the islands. The incumbent president Azali seized power in a coup in 1999. He was re-elected in a 2016 vote marred by violence and allegations of irregularities. Tensions have been running high since a contested referendum in July 2018 that enables the rotating president to hold two five-year mandates instead of one. After his victory on Sunday, Azali is considered as starting a first term, allowing him to vie for a second in 2024. The referendum sparked violent protests and dozens of officials and opposition activists have been arrested in recent months. In October an armed rebel group clashed with Comoran security forces in Mutsamudu, the capital of opposition-leaning Anjouan which had been next in line for the presidency. Both observers and community groups have questioned the credibility of the election, which saw Azali declared the winner with almost 61 percent of the vote. Lacking the infrastructure that draws tourists to Mauritius and the Seychelles, the country's main activities are fishing and agriculture. Vanilla, cloves and above all ylang-ylang -- the tree whose fragrant oil is used to make perfume -- are the principal sources of hard currency. The country is heavily dependent on remittances from emigrants, notably in France which is home to 200,000-300,000 Comorans. It is at the tail end of the UN's Human Development Index -- which compares life expectancy, education and living standards -- and ranked 165 from 189 in 2018. The World Bank says the Comoros must tackle hunger and malnutrition, with almost 18 percent of its population living on less than $1.90 a day, the international poverty line. It projected economic growth in 2018 at a stable 2.7 percent.